Leftovers are a fantastic part of every holiday. Jay Yates of The Veranda in Starkville was the first to reply: “Turkey sammich on white bread with mayo and lots of pepper.” He also likes to boil the carcass, add andouille, and make gumbo! Jean Kilgore said she makes turkey sandwiches and potpie with her leftovers. Barbara Middleton likes her turkey on wheat bread. Marcelle Robertson likes leftover turkey on white bread with mayonnaise, salt, pepper and onion. This year, my mom bought homemade rolls from Christine May and a deep-fried turkey from The Tracks. 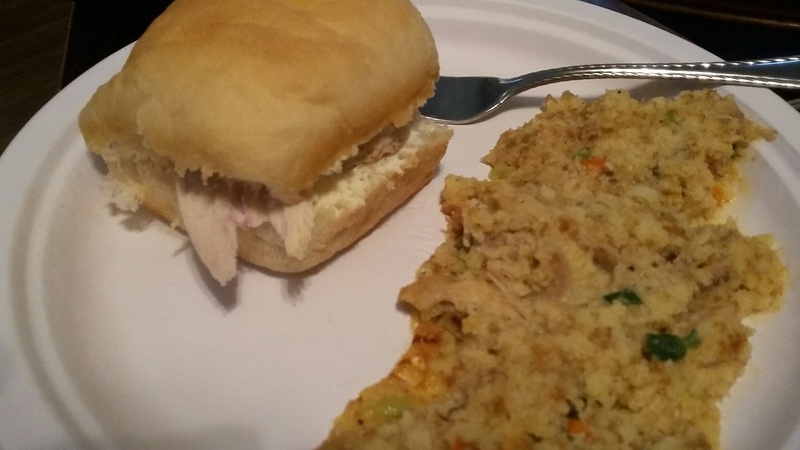 We have been making turkey sandwiches on homemade rolls all weekend. What a fantastic way to enjoy leftovers! Christie Colvin said one of her friends from high school would eat dressing sandwiches! That’s a little different, but if you love dressing, I guess that’s the way to go! Marsha Woods makes turkey salad with her leftovers. Much like a fall chicken salad, turkey salad can be a fun alternative to typical holiday leftovers. Mix all ingredients until well blended. Great on sandwiches or with snack crackers. Combine the turkey, ham, cranberries, egg, and basil in a mixing bowl. Stir in the mayonnaise. Season to taste with salt and pepper. Pamela said she doesn’t really use a soup recipe, except for inspiration! After the broth has simmered a couple of hours, take the meat off the carcass, strain out all the vegetables and put the broth back in the pot with 2 or 3 cups meat, a chopped carrot, 2 sliced ribs of celery, 1 cup diced onion (you can saute all these in a little butter and it really brings out the flavor). Add some kind of starch such as rice, barley, noodles, take your pick. Awad said she wanted to use barley last week but could not find any. She said you can also use a bean — garbanzo is mild, so is great northern. Beans are a great starch that also has protein! Lots of people add corn, but Awad does not, for personal reasons. Awad said you can add leftovers like butterbeans, green peas, roasted vegetables like turnip and butternut squash and sweet potato. Place the turkey carcass in a large stockpot. Add 1/2 of the onions, carrots, and celery. Add bay leaves, salt and pepper. Cover the turkey with 3 quarts of water. Place over medium heat and bring to a boil. Reduce heat to medium low and simmer for 1 hour. Do you have a favorite recipe you would like to share? Contact Gwen Sisson at gwenwoodssisson@yahoo.com. This food column was featured in the December 1, 2016 edition of The Winona Times.